Two days dedicated to facade cladding were organized by the "Ecole Nationale Supérieure d'Architecture-Paris-Val de Seine" on March 21st and 22nd, 2018. The aim was to present to building advisors - architects, design and engineering offices - innovative solutions for facades in terms of performances and aesthetics. 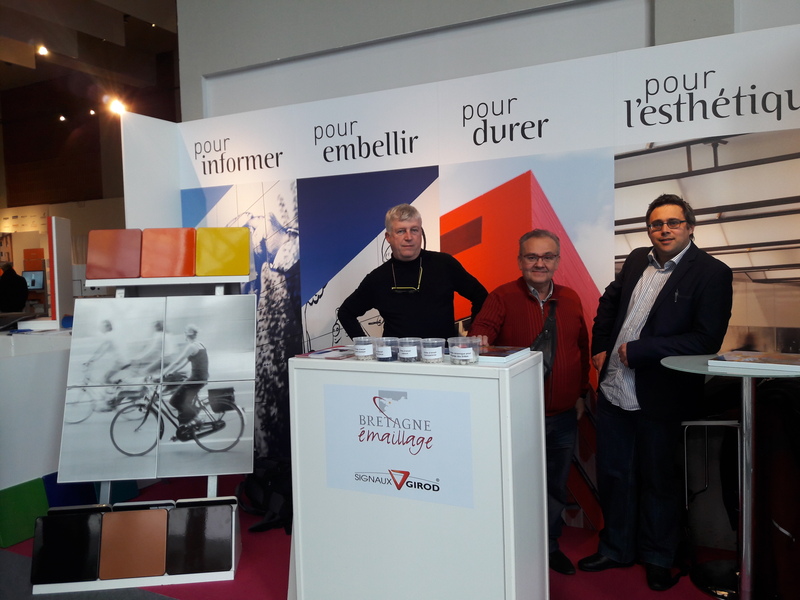 The enamelled steel was present in a booth set up by the Association of French Enamellers (APEV) with the participation of two enamellers, clients of ArcelorMittal , Bretagne Emaillage and Signaux Girod. About 1000 Architects visited the fair, and almost 100 visited our stand where they could discover many samples of our Solfer® steels made in Florange that were enamelled by our two customers with simple colour or more complex visuals. Many questions and requests were asked from the architects, who did not know enamelled steel, its multiple properties, and its possible application for construction. Enamelled steel meets very modern criteria of durability, aesthetics, hygiene and respect for the environment. They are recognised for their resistance to UV and corrosion, even on cut edges where they are covered by enamel. “What makes our Solfer® enamelled range unique is the fact that many of the products have emerged from collaborative thinking with our customers to solve their technical problems and address business challenges. Be it the need for aesthetically beautiful surface finishes or simplified processing steps, our enamelled steel solutions have always allowed our customers to take a leap forward with their choice,” explains Patrick Le Pense, Product Lead for cold rolled products at ArcelorMittal Europe – Flat Products. “ArcelorMittal is a premium partner for the supply and processing of steel for enamelling. We propose the widest offer on the market with environmentally friendly and cost-effective solutions. Our products are adapted to all forming and enamelling processes. Their use simplifies implementation at the customer and allows sophisticated designs,” completes Philippe Gousselot, New Products Development at ArcelorMittal R&D.